What is meant by the “inner game of dating”? Are you single and wondering how to have that deeper meaningful partnership yet something is holding you back? Are you confident that you are clear about what you want so that you can magnetize a special partner or do you have doubts? What steps do you need to take to “get there”? ♥ Cary describes what is the inner game of dating and how that relates to finding that special person. ♥ What does Cary see as the #1 element in magnetizing a partner? ♥ Cary Shares the 3 essential things our listeners can do today to create a juicy relationship. ♥ Cary gives us insights on what guys want in a relationship that woman often don’t get and what the big attractant is for him. ♥ And how does this all relate to up-leveling your inner game of dating for marriage? For over a decade Cary Valentine has been assisting many couples and singles, throughout the world to transform their lives out of the emotional pain of relationship and dating challenges to creating joyous, juicy, sustaining relationships of their dreams through his In Love Forever personal development system. He is certified relationship coach and a frequent guest on ABC & CBS Radio Networks. Cary is an international motivational speaker about living with more passion and success and is an award-winning, best-selling author of the book In Love Forever: 7 Secrets to a Joyous, Juicy Relationship, which he co-wrote and lived out with his late wife, Wendy. Valentine’s innovative and proven patent pending, Turn Your Doubts Inside Out System – quickly helps to transform fears, doubts and worries permanently, by creating more confidence, success, pleasure and joy. He enjoys coming home from world travels to the sight of colorful roaming chickens and the enchanting tropical aromas of the Hawaiian island of Kaua’i. 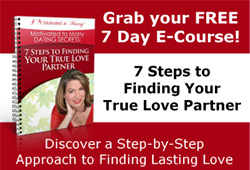 Take this fun, quick questionnaire to help you discover how ready you are to experience a joyous, soul connected, lasting relationship. Get a clear sense of how ripe you are to experience a deeply satisfying, fulfilling relationship; and what areas need to be further supported so you can have it all…especially the Loving Relationship Of Your Dreams! ‹ I’m turning 40, a husband or a baby, do I have to choose?